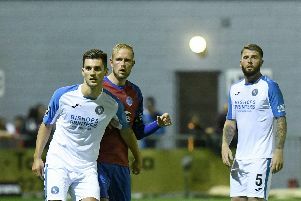 A gritty performance went unrewarded as the Hawks slipped to a 3-2 defeat at unbeaten National League leaders Harrogate Town, writes Glenn Thorpe. Nicke Kabamba was at the double for Lee Bradbury’s side at Wetherby Road but it proved not enough. The injury-hit visitors had four key players ruled out and were forced to ring the changes. Captain Brian Stock, Wes Fogden, Jordan Rose and Mike Carter were all absent. Lee Bradbury brought Aaron Cosgrave, Andreas Robinson and Josh Huggins into the starting line-up from Wednesday’s win over Aldershot. New loan signing Jordan Simpson, from Forest Green Rovers, was on the bench. Bradbury’s troops made a bright start and on six minutes gained their reward. KABAMBA put the visitors ahead with a precise low finish from the edge of the area. The advantage only lasted six minutes, though, as Harrogate hit back quickly. A half-cleared corner was returned into the area by Joe Leesley and Callum HOWE scored with a powerful header. On 35 minutes Kabamba went within inches of restoring the Hawks’ lead with a shot across that was just off target. The Hawks fell behind seven minutes into the second period when they failed to clear a corner. After a scramble the ball went loose it fell to Dominic KNOWLES a few yards the striker poked it in from close-range. Within five minutes the Hawks found themselves further behind when Jack MULDOON tapped in from close range. However, the visitors refused to let their heads drop and on 62 minutes KABAMBA got the Hawks back into the game. The ex-Pompey striker neatly chipped an effort over the onrushing Harrogate keeper. Both teams continued to go for it as the game headed into the closing stages. In the final minute Hawks keeper Ryan Young produced a good save to keep out a powerful shot from Leesley.